Do the letters USB, DSL, and IEEE mean anything to you? If so, then the Magnetic Poetry Geek Kit might be for you. There are no Ethernet cables or networks to set up; just take the word tiles out of the box and start moving them around. Before you know it, you will have created terabytes of geek-inspired poetry without so much as a keystroke. Open up a box and let the old-fashioned, new-fangled fun begin! CONTAINS - over 200 themed magnetic word tiles in a cute, colorful, giftable 4.75 x 3 inch box. Rearrange the words to write poems, messages to your roommates, or generative esoteric word art masterpieces whose meaning is lost even to you. Magnetic Poetry is both a creative writing aid, and just a really fun and limitless toy. They're not just fridge words, you can write an ode on your commode, an elegy on your doorknob, a haiku on your car hood, or a novelette on your omelette maker. MIX AND MATCH WITH OTHER KITS - Tile height is 0.375 Inches, compatible with nearly all other Magnetic Poetry sets. With dozens of other themed kits, the possibilities are endless. You can mix and match to create custom combinations, and custom gift ideas. Magnet words make a great dorm room accessory, or locker decoration. They're also a perfect gift for poetry lovers, or a gift for writers of any kind, and as a graduation present, you can't go wrong. MADE IN THE USA - Magnetic Poetry sets are made in America, are nontoxic, and comply with all American and international safety guidelines and regulations. Magnetic Poetry is the inventor of the magnetic word tile, and we're still a small US company that takes great pride in every set we make. Read more about our company in the product description below. OVER 100 DIFFERENT SETS - Please click on the Magnetic Poetry brand name below the title of this page to browse other sets made by us. Color: Geek Do the letters USB, DSL, and IEEE mean anything to you? 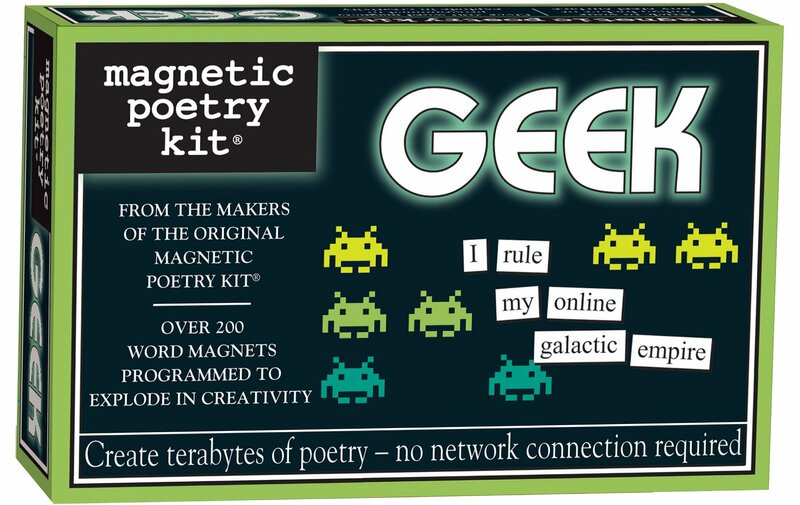 If so, then theMagnetic Poetry Geek Kit might be for you. There are no Ethernet cables ornetworks to set up; just take the word tiles out of the box and start movingthem around. Before you know it, you will have created terabytes of geek-inspired poetry without so much as a keystroke. Open up a box and let the old-fashioned, new-fangled fun begin! Kit contains over 200 themed magnetic wordtiles.